The result for the Criminologist board examination for April, 2014 is announced by the Professional Regulation Commission (PRC). A total of 13, 873 took the examination and 4, 688 of them passed. The said examination took place in Manila, Baguio, Cagayan de Oro, Cebu, Davao, Iloilo, Legazpi, Lucena, Tuguegarao and Zamboanga. Among the several schools who took the exam this April, University of the Cordilleras (For. Baguio C.F) dominated Criminology board exam for the 34th time. University of Cordilleras got 99.09% passing percentage and it was named rank one (1) top performing school for April 2014 Criminologist board examination. A record of 109 examinees passed out of 110. These schools have 50 or more examinees and with atleast 80% passing percentage. 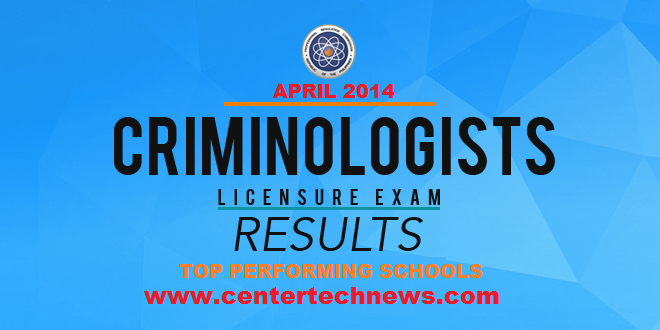 You can also read about the top ten examinees for the April 2014 Criminologist Board Examination.